After a couple unusual days in SoCal waiting for the new snow to cook down in the Sierra, I rallied back up 395, left my bike at the Cottonwood Lakes trailhead, and drove back to Tuttle Creek. 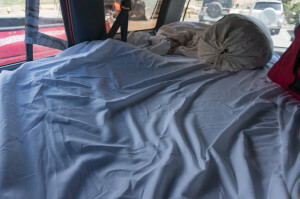 Driving at night and unsure of the road conditions, I backed down from about 6,600′ to a camp spot at 6,500′. The road was every bit as sandy as I remembered, but my “new” car is more suited to such things than the Celica I drove last time, so I didn’t leave it on three wheels in the middle of the road. Compromising between my need for sleep and desire to get on a northeast-facing snow climb early, I set my alarm for 5:00, and was hiking by 5:30. 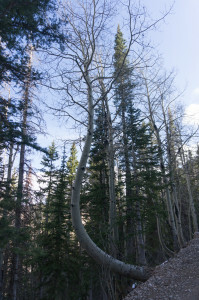 After passing the “trailhead” around 6,900′, I followed a well-defined trail to the ashram, then continued along what was essentially a cairned game-trail up the north side of the south fork of Tuttle Creek. The trail stays 50-100 feet above the stream to avoid the worst of the brush, finally climbing steeply to an open area where the valley broadens. 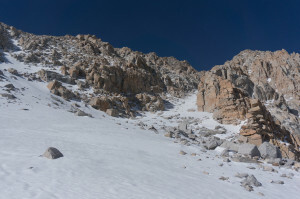 The trail fades as it climbs through this section — most people are smart enough to do this snow climb while there’s snow — but a line of cairns eventually crossed the stream and makes its way along the base of the talus to the base of the couloir. With the insanely-dry Sierra winter, what I remembered as low-angle snow last time was instead a vast talus-field partly covered in fresh snow, with some slabs to one side. The snow was breakable crust over sugar, so I treated it as lava, hopping from rock to rock where I could where I couldn’t march up the bare slabs. 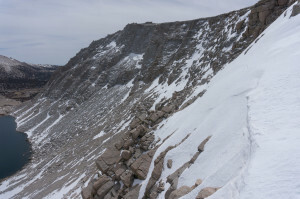 Finally turning the corner into the main northeast couloir, I saw that it was well on its way to melting out, but a winding line of snow remained. The snow seemed easier than the loose debris beneath, and I was here to do a snow climb, so I took out my axe and started kicking steps. It was a bit of a mess, with new, drifted and/or crusty snow over the remaining winter snowpack, but with a bit of experimenting I was usually able to find a supportive line, sometimes even following an old boot-pack. Somewhere around 12,000′ the snow finally became steep and hard enough to require crampons, which I donned sitting on one of the many exposed rocks. The branch I chose eventually melted out a couple hundred feet below the summit plateau, so I went back to scrambling from rock to rock until I topped out. Like last time, the temperature dropped dramatically as I transitioned from the sheltered snow of the couloir to the wind-blasted summit. I found a sheltered spot, read the register (other people complaining about the poor snow quality in the NE couloir, mostly), and took a look at the surroundings. The area south toward Horseshoe Meadows looked mostly dry and warm, while the alpine lakes between Langley and Whitney were still frozen. A sane person would go back the way he had come, but this was a “work” climb, so I headed off on some version of the standard route to Old Army Pass. With the crust-over-sugar snow everywhere, I quickly lost the increasingly-established trail, cliffed out a bit, and spent quality time punching through the crust and then bashing my shins on it. 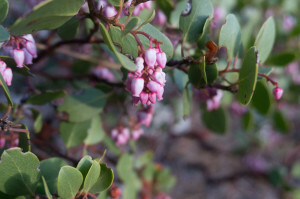 My optimistic belief that the spring Sierra in a low-snow year would be as friendly as the summer Sierra in a normal year was proving ill-founded. Old Army Pass was every bit as treacherous as one would expect early-season, with a steep, hard snow-slope covering the normal summer trail. 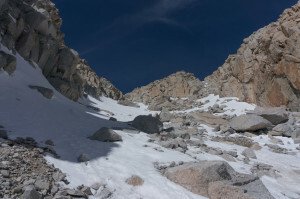 I bypassed parts, carefully side-hilled others in crampons, and eventually got below the serious snow a few hundred feet above the highest Cottonwood Lake. Now there was nothing left but the standard sand-slog back to the trailhead. I passed only two people on my way through the normally-crowded area, reaching the trailhead to note happily that no one had stolen my bike. Now for the fun part. I hit 42 MPH on the first drop, ground out the little climb, then sat up and braked to keep my speed to a sane 30-35 MPH on the straights and 20 on the turns. I felt pretty stoked as I blew past some people walking down the road, probably hoping for a lift. Rounding the final turn onto the last, straight switchback, I assumed my best tuck and let go, and was elated to hit 51.8 MPH before reaching the valley floor. The road drops more gradually to the Tuttle Creek turnoff, so I could cruise along easily at 20+ MPH for awhile. Unfortunately, I had something like an 1,800-foot climb from Horseshoe Meadows road to my car, and was completely out of water. I could take it easy on the roughly-paved Granite View road, but the sandy track to Tuttle Creek was another matter. It was a long, grim slog, with several stops, a bit of walking, and a terrified slow-motion sprint past some jerk’s bee colony right next to the road. After about 9h30 of varied “adventure” I was back at the car. I’m glad I did it, but wouldn’t do it again. 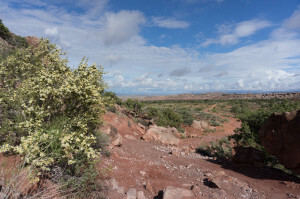 I had hoped to ride the White Rim Road, a 103-mile loop around the Island in the Sky district of Canyonlands, so I wanted to take an easy day after Phil’s World to prepare. I also didn’t want to drive much, so Abajo Peak, the highpoint of a small range west of Monticello, seemed like a good low-ambition goal for the day. After sleeping at the base of the old ski area, I decided to take the dirt road up the south side instead, figuring that the remaining snow in the woods would be annoying. It had rained the night before, and the bottom part of the dirt road was wet and mucky. Not wanting to coat my bike with mud, I drove past the area of the localized rain shower, then started riding from around 8,000 feet. 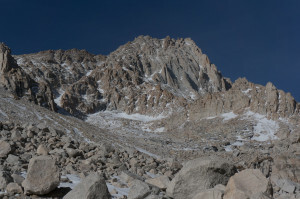 The road was consistently steep, but dry until it turned the shoulder of South Peak to cross a north-facing slope, where it was blocked by snow. 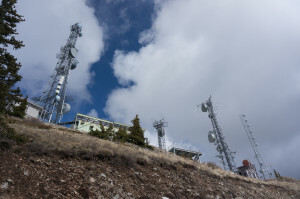 Locking my bike to a tree, I walked the rest of the road to an exceptionally large and ugly collection of buildings and radio towers on the summit. Not being in any hurry, I walked most of the way back to my bike, then coasted to the car. 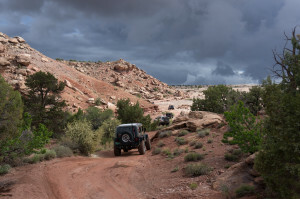 After getting some new and hopefully less mobile cleats, I hung out in Moab for awhile, then drove up to the start of the White Rim Road to camp. Waking to steady rain, I abandoned my riding plans and headed back into town, where I killed a day in the public library with the other dirtbags, then drove back to my previous camp. A large group of cyclists was finishing a multi-day tour of the White Rim as I arrived, looking generally miserable as they straggled in on mud-caked machines. As they described repeatedly dismounting to knock the mud out of their dérailleurs, I decided I would give things a bit more time to dry out. After driving back to the highway, I pulled in near the Klondike Bluffs trailhead on BLM land to camp, and was surprised to find maps of what was apparently a relatively new mountain biking area. 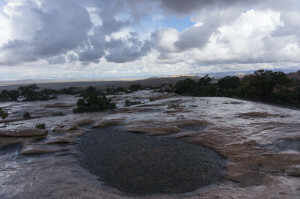 Maybe I would have a chance to ride it the next day while the White Rim dried. 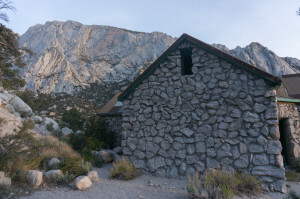 Unfortunately, I woke to find it had rained more overnight, so after driving through some nasty muck to the trailhead, I instead decided to jog 4-5 miles of jeep road to the Klondike Bluffs. 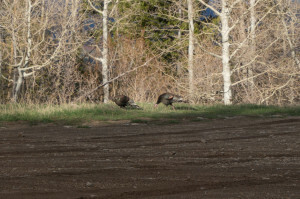 A couple of riders pulled up as I prepared, including one professional woman with a striking quantity of wavy red hair. Though they were apparently willing to ride the wet, sandy trails, I preferred to wait for things to dry out a bit. I explored the Bluffs a bit, got poured on for about 5 minutes, then jogged back to the trailhead, passing a convoy of about 10 jeeps on the way. More riders arrived as I ate and eyed the weather. Though it never truly started raining, it sprinkled off and on, and it looked either overcast or raining back toward Island in the Sky. Clearly I was not meant to ride the White Rim this spring. 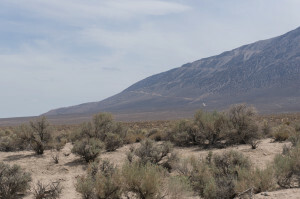 With miles to drive and a one-day weather window in Nevada the next day, I looked through my list of things to do, then headed west for Ely, Nevada. 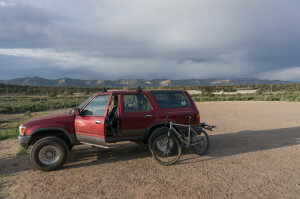 Based on Mike’s recommendations, I stopped at the Durango Walmart to improve my sleeping situation, then drove over to the Horse Creek trailhead to explore the nearby network of supposedly easy trails. Early on a Saturday afternoon, the large parking lot with the sign was mostly full. Heading up the old road, I mistakenly bypassed the trails, eventually ending up on a well-graded country road on the other side of a minor pass. After realizing my mistake, I returned to the first obvious trail on the north side of the road. Less than 100 yards up the first climb, I slammed on my brakes to avoid running over a lethargic snake, then fell over when I couldn’t unclip fast enough. 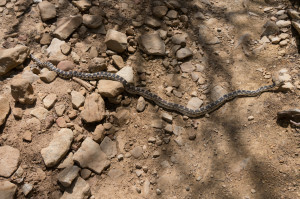 I shoo-ed the lethargic snake to safety, then continued up toward Raiders’ Ridge, mostly hiking up some steep slabs that I probably should have been riding down. I probably should have turned around. 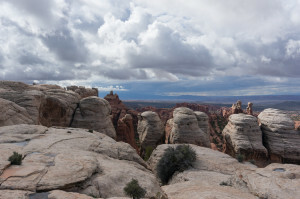 Reaching the ridge, I turned uphill, riding up miserable little sandstone steps. Occasionally, one of them would be big enough to stop me, and I would either manage to unclip in time, or topple over on my side. After doing this a few times, I realized that my cleats were slipping, frustrating my attempts to unclip. I tightened them as much as I could, then turned around, getting off the wretched ridge at the first opportunity. 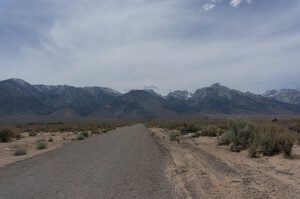 Once back on the road, I headed toward the trailhead a bit, then turned south into the Meadow Loop area, where no-skills people like me are supposed to ride. Life improved considerably, modulo occasional stops to reposition and tighten a cleat — I still haven’t figured out how to make them stay put without stripping the bolts. After much climbing, the descent on a counter-clockwise tour of the outer Meadow Loop was fast and fun. With plenty of daylight and energy left, I decided to explore the Telegraph trail, which climbs a hill south of the meadow past some old telegraph poles. This I also found manageable, though the signage at the spread-out 4-way intersections was confusing at times. I had intended to ride something longer, but ended up returning via Sidewinder, a fast, swooping, banked descent toward a different trailhead. This was probably the highlight of the day, as I was able to get out of my normal terrified-self-preservation mode for most of the descent. I took the paved Animas trail back to the car, ate some stuff from cans, and drove on toward Cortez. After camping a bit farther up the road, I returned to the well-signed and -developed Phil’s World parking lot, empty at this early hour. The night had been relatively warm, but the sky was overcast, and rain threatened to the east. 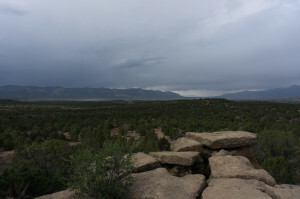 While Mesa Verde and Ute Peak rise fairly impressively to the south, Phil’s World lies in gently-rolling terrain covered in juniper and sage, the kind of land I would normally think is best suited for dumping old mattresses. 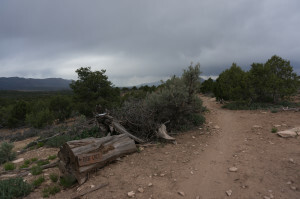 The trails have two parts: the smaller “Trust Loop,” and the main collection of loops across the road from the parking lot. All of the trails are one-way: not only are they signed for clockwise riding, but they have been expertly built so that drops and other obstacles are encountered on the downhills. Also, simply turning left at all but one well-signed intersection results in riding all the trails. Having nothing else to do all day, I started by riding the outer perimeter of the main area. 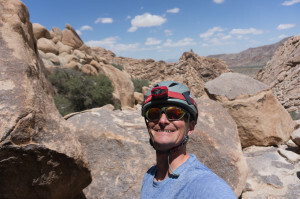 This was mostly fast and fun, with the smooth, banked trail meandering among the junipers as it goes around and over small hills and sandstone outcrops. The main exception is the Ledges Loop, which spends more time on unpleasantly rough sandstone. 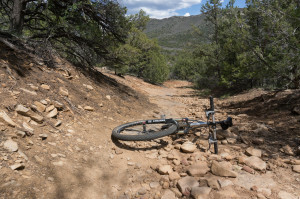 I ate it once on this section, possibly bending my rear derailleur, but found most of even this part ridable. 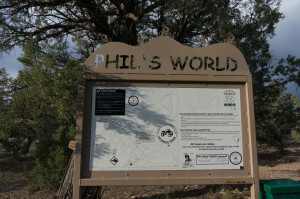 The highlight of Phil’s World is Rib Cage, a smooth trail that swoops and dips along an arroyo, with perfectly-banked turns and a variety of dips and jumps. After trying it once, I returned to the car for more water and canned food, eyed the weather for a bit, then checked out the Trust Loop. That proved mostly easy and underwhelming, though increasingly hot as the sun finally came out. Returning to the now-crowded parking lot, I refilled my water, then did three more increasingly-fast laps on Rib Cage — it’s that good.